Over the past several weeks, CLV has escalated tensions with the residents of the Stoney Creek Towers, in a vain effort to isolate and intimidate tenant organizers. They have installed over 100 new surveillance cameras, and have hired private security to patrol each of the four buildings 24/7. These rent-a-cops have harassed tenants, in some cases demanding they show ID to prove that they live in their building. They have also instituted a blatantly illegal ‘NO LOITERING’ policy covering the buildings’ common areas in a transparent attempt to criminalize tenants for holding their weekly lobby meetings, which have been taking place for months without incident. They’ve attempted to break up these lobby meetings with goonish tactics, and when that has failed, they have stood on the sidelines videotaping their participants. They’ve issued trespass warnings banning HTSN members from the building complexes, and hired a high-priced law firm to draft up a threatening letter warning of further prosecution. They’ve built literal WALLS to seal off the lobbies of two buildings. And they’ve resorted to calling tenants who have only recently joined the strike, yelling at them and demanding that they pay their rent. All of this has been a desperate and ultimately vain effort to crush the rent strike in the lead-up to their AGI hearing, scheduled for November 1st and 2nd. Tenant organizing interrupts business as usual and poses a direct threat to CLV’s profit model. CLV has resorted to desperate, illegal tactics in an effort to quash this threat. Tenants have held firm in the face of these intimidation efforts. 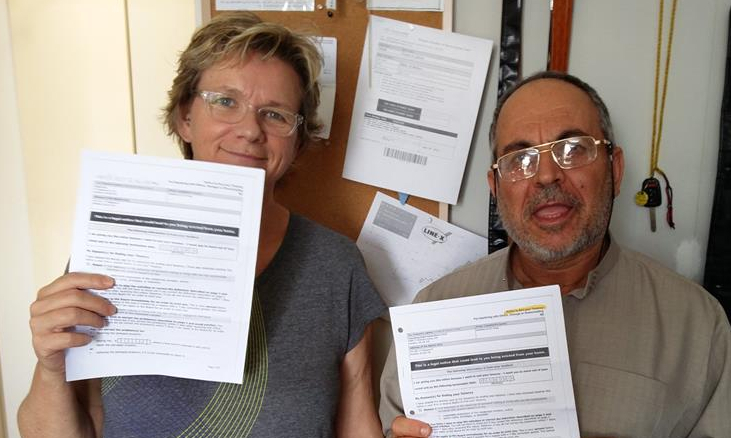 On Wednesday Oct 3rd, CLV employee and Stoney Creek Towers property manager, Oliver Filip, went around the four buildings with a big stack of N5 eviction notices, delivering them to tenants who have continued to participate in lobby meetings. Recipients included 82 year old strike captain, George Direkz, whose alleged offense was ‘loitering’ in the common area of a building he has lived in for nearly a decade. Like their earlier efforts, this pathetic attempt at bullying their tenants will fail. Tenants at the Stoney Creek Towers have filed an application at the LTB against this campaign of harassment, obstruction and intimidation. They will be seeking a rent abatement for the loss of their lobbies, and will be seeking the maximum fine of $100,000 for CLV’s wanton and repeated infringement of their right to the reasonable enjoyment of their building complex (including the right to organize with their neighbours). These latest N5 notices have only provided the tenants with more evidence to use in their case. Thanks CLV Group! Tenant organizing interrupts business as usual and poses a direct threat to CLV’s profit model. CLV has resorted to desperate, illegal tactics in an effort to quash this threat. Tenants have held firm in the face of these intimidation efforts.